Yesterday on this blog we remembered the one hundredth anniversary of the start of the Armenian Genocide. One day after that came another historic event of World War I, also happening to be associated with Turkey. 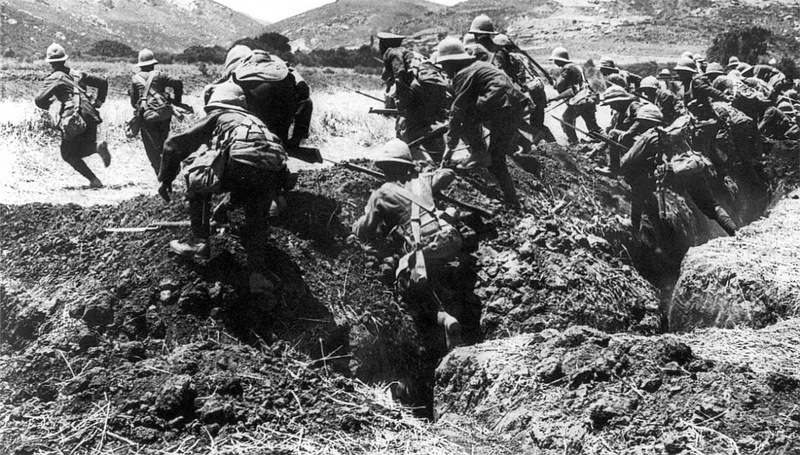 It was on April 25th, 1915, that Great Britain along with most of her Commonwealth nations (Australia, New Zealand, Newfoundland, and India) as well as France launched what is arguably one of the most ambitious operations of twentieth century warfare: the Gallipoli Campaign. The Gallipoli offensive had as its goal the securing of the Dardanelles between the Black Sea and the Mediterranean, which would have given Russia a sea route to its allies. But the British and French figured that they'd do better than that... by capturing the Ottoman capital of Istanbul. The amphibious assault landed on two beaches of the Gallipoli Penninsula: Cape Helles and what has become known as Anzac Beach, on April 25th. Four other landings followed, bringing five divisions onto Turkish soil. A few days later the real fighting began. Eight months later the Allied forces were forced to retreat. They came nowhere close to taking Istanbul. The Dardanelles were still in Ottoman hands. And of the more than half a million personnel who had been committed to the battle, almost half were casualties. Nearly 45,000 never came home. Even so, the Battle of Gallipoli became, and remains today, a point of pride for the Allied nations who fought in it, especially Australia and New Zealand, for whom today is known as Anzac Day. And all of this began one hundred years ago today.